Eine neue Identität für eine Kampfkunstschule. Die Wushu Taichi Akademie ist eine traditionelle, familiengeführte Kampfkunstschule in Konstanz. Mit einer langen Familiengeschichte, die bis nach Guangzhou [CHN] zurückreicht, war sie eine der ersten chinesischen Kampfkunstschulen in Deutschland. Die visuelle Identität wurde komplett überarbeitet. Von Printprodukten, über Werbekampagnen bis hin zur digitalen Präsenz wurde eine neue Markenidentität entwickelt. Dieser Beitrag wurde unter Design abgelegt am 24. April 2019 von Andreas. Tough competition on the ecommerce market makes retailers continuously search for new ideas to improve web stores‘ UX. Optimizing the product page is one of the key areas in this quest for enhancements. We reviewed the best practices of ecommerce leaders and success stories of smaller merchants, and came up with three hacks that make any product page convert more visitors into customers. A good product description is a top factor influencing customers‘ desire to purchase. The problem is customers want to get answers to their questions, but they don’t want to read a lot. Average web-surfers give a web page no more than 15 seconds to capture their attention. If a product description fails to meet this deadline, it fails to convert. Start with a unique value proposition: A brief product description that welcomes a potential shopper must clearly explain what is so special about this item. A selling product page doesn’t speak about features, it shows what particular benefits customers get when they buy the item. Avoid visual overload: Structure key information using headers and collapsible sections to save space on the page. This makes product pages more transparent and interactive, as well as minimizes the time required to get the key ideas. The screenshot below shows how Oliver implements these principles on their product pages. They hide the detailed information about product features, materials and delivery options in expandable sections. Mulberry went a step further and combined tabs for Description, Details, Material, and Size Charts with pop-ups for Delivery and Returns. The result? All types of customers get excessive information about the product without reloads and scrolling. The case of The Sims 3 manufacturers also proved that clarity and order drive conversion. They tested six versions of the “game launcher,” all of which had particular benefits, simpler design, and lesser information. As a result, conversion increased up to 128%. Human beings are very good at processing visual information, much better than at reading. This means pictures and colors on product pages create the first impression of items and thus are even more important than descriptions. Size matters: A product image is the only way for a customer to feel the product. So make sure that shoppers can zoom in to examine the product in detail (its fabric and tiny parts). These are not just words. Larger images helped Skinner Auctions by 63%. Skinner Auctions scaled their catalog images from 250 pixels to 350 pixels. And what’s even better? The amount of bidding visitors who actually filled out all the online forms required to place a bid rose to a huge 329%. Angles matter as well: Surprisingly, it is a common mistake to show the product only facing forward. Customers want to see the interior pockets of a purse, the back of a dress, and the outsole of a shoe. 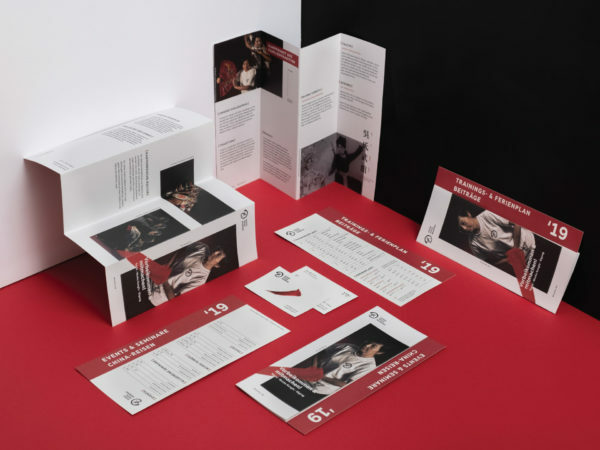 A well-selling page features the product from different angles or even provides a video showing how it looks in motion. 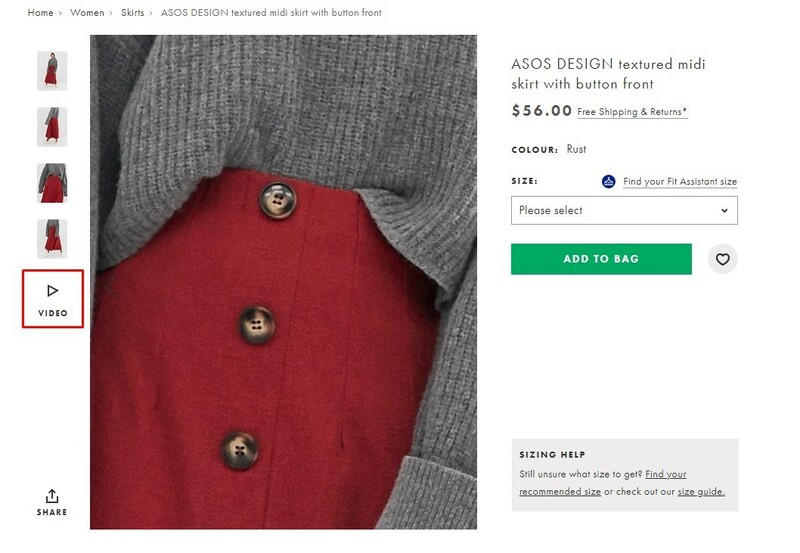 Look at ASOS, they allow you both to inspect the skirt’s texture and buttons and to watch a short video clip. Customers want to try on items: Online shoppers are concerned about how items will suit real them rather than professional models. Many successful web stores show their products on people with different body shapes. This helps customers imagine themselves with items and make purchase decisions easier and faster. 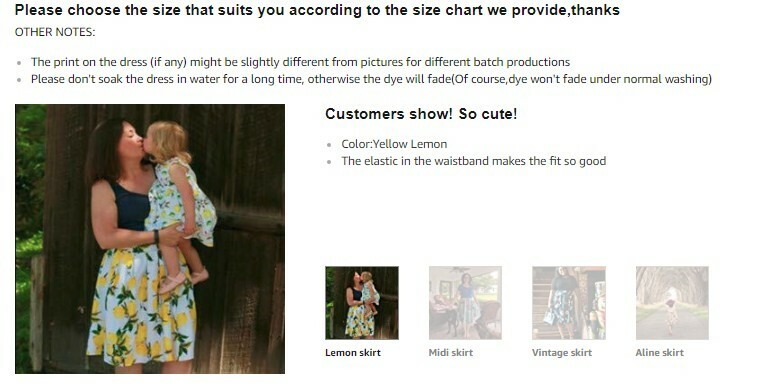 We believe people more than models: Amazon and ModCloth ask their customers to share personal photos in the product reviews. Such a gallery is included in the product description to show customers how items look in everyday life and make the product page more trustworthy. Do online retailers have fewer opportunities to talk to their customers than brick-and-mortar do? Not really. Though communication between web stores and shoppers doesn’t happen face to face, merchants can still say everything customers want to hear and ask for everything they need to know. Answers the questions of the customers that are already on the page. Attracts new visitors to product pages from the browser’s search results. Helps keep product descriptions short. Apart from a full-fledged FAQ, you can try short tips as RollerSkateNation.com did. Their sincere advice was not oriented on increasing sales directly. In fact, it showed customers how to replace roller states for kids less frequently by buying larger items and wearing double socks. Customers felt taken care of and increased purchases by 69%. The position of the tips and the FAQ section is also important. In the above case study, RollerSkateNation managed to further boost revenue by 99% by placing their hint below the product description. Customers had enough time to process key details and then got really useful advice as a surprise. Use reviews to build trust. When it comes to making a purchase decision, reviews are almost as important as product descriptions and prices. Most shoppers look for reviews and, at best, they can read credible feedback right on the product page. This way customers don’t have to leave the web store and are less likely to choose another vendor. The case study of Express Watches proves that a well-designed Reviews section can increase conversion by 59%.What does this “well-designed” mean? The product page should let shoppers sort and rate reviews, add images and stars. To show even more credibility, you can pick some reviews and put them forward as testimonials. And for sure be careful with negative reviews. Try to express your professionalism and care. In fact, a well-processed negative review can be even more convincing than a dozen positive ones. Ask customers how to improve conversion. 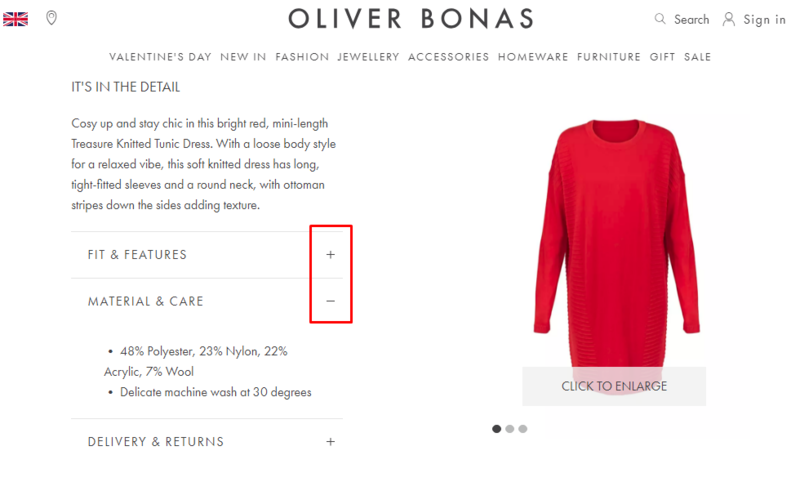 Small details, like words and button colors, influence the success of product pages. Though A/B tests make attempts to polish the web store less risky, don’t be shy to ask customers directly about their impression. 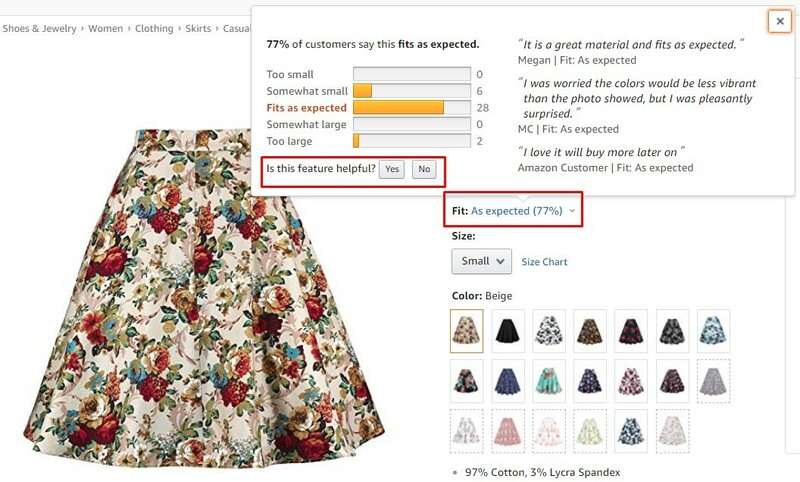 For example, Amazon introduced a new feedback feature that shows how shoppers rate the size of the item. 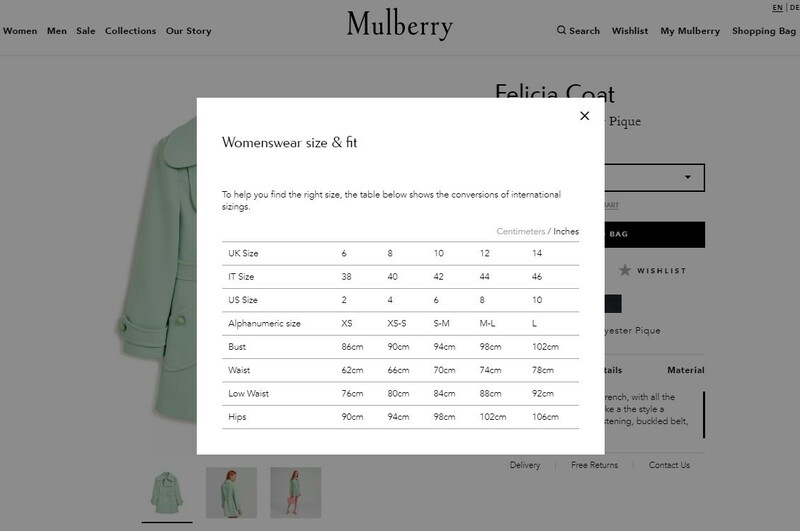 By the way, this is a great CX feature per se that allows customers to quickly understand which size to take without exploring the size guide. But now pay extra attention to their poll about the utility of the feature. Why not ask customers if you can do it? However good best practices are, they work well nine times out of ten. Unfortunately, there is no guarantee that your case isn’t the tenth one. Trust seals normally improve conversion as they make the website look trustworthy. But Icouponblog managed to increase their conversion by 400% by removing a security badge. What does this mean for you? The theory is worth reading, but real results appear only after you test and try. Devote enough time to validate your ideas, and you will definitely find the way to a high-converting product page. Maria Marinina is a Digital Marketing Manager at Iflexion. The post Three ideas to create a high-converting product page appeared first on Search Engine Watch. Dieser Beitrag wurde unter SEO abgelegt am 24. April 2019 von Andreas. The post Dare to Be Different: 5 Fresh Examples of Innovative B2B Content Marketing appeared first on Online Marketing Blog – TopRank®. Absolute Wiedererkennung für das Unternehmen Völter. 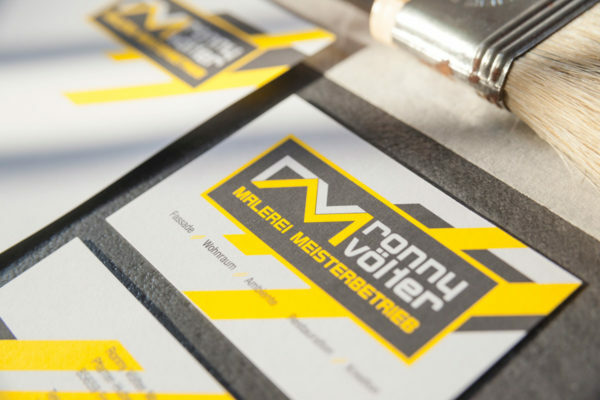 Die Malerei sticht mit dem Design in Neon-Gelb – Steingrau-Matt komplett aus der breiten Masse heraus. Die klassischen Farbstreifen wurden durch moderne Elemente und neu definierte Pinselstriche ersetzt. Durchgängig präsentiert sich die Firma intern und extern mit der neuen Geschäftsausstattung im zweifarbigen Sonderdruck, sowie mit Spezialfolie auf der gesamten Fahrzeugflotte, Außenwerbungen und Anhänger. Das Outfit für alle Mitarbeiter besteht aus einem gebrandeten Arbeitsshirt und einer hochwertigen Arbeitshose in weiß mit Details und Nahtstreifen in Neon-Gelb. Beide Teile als Sonderanfertigung für das Unternehmen. Final wurde der Internetauftritt überarbeitet. Responsive und zeitlos. Das Corporate Design, sowie die Realisierung erfolgte über das Moosburger Grafikbüro Die Signatur. Dieser Beitrag wurde unter Design abgelegt am 23. April 2019 von Andreas. If content is queen, and the critical role SEO plays a role of bridging the two to drive growth, then there’s no question as to whether or not keyword research is important. However, connecting the dots to create content that ranks well can be difficult. What makes it so difficult? How do you go from a target keyword phrase and write an article that is unique, comprehensive, encompasses all the major on-page SEO elements, touches the reader, and isn’t structured like the “oh-so-familiar” generic SEO template? There’s no one size fits all approach! However, there is a simple way to support any member of your editorial, creative writing, or content team in shaping up what they need in order to write SEO-friendly content, and that’s an SEO content brief. Quality – Reduces garbage in, garbage out. Any good editor will tell you great content comes from having a solid content calendar with topics planned in advance for review and release at a regular cadence. To support topical analysis and themes as SEOs we need to start with keyword research. Spend time understanding your target audience and aligning their goals to your keywords. Many call this keyword intent mapping. Rohan Ayyr provides an excellent guide to matching keywords to intent in his article, ‘How to move from keyword research to intent research‘. Do the keyword research in advance, it will allow writers and editors the freedom to move things around and line it up with trending topics. How does all this help in supporting a content brief? You and your team can get answers to the key questions mentioned below. What will they write about? Primary keywords serve as the topic in your content brief. Who is the intended audience? Keyword intent helps unearth what problem the user is trying to solve, helping us understand who they are, and what they need. Now with keywords as our guide to overall topical themes, we can focus on the next step, topical expansion. Writers need more than keywords, they require insight into the pain points of the reader, key areas of the topic to address and most of all, what questions the content should answer. This too will go into your content brief. We’re in luck as SEOs because there is no shortage of tools that allow us to gather this information around a topic. For example, let’s say this article focuses on “SEO writing”. There are a number of ways to expand on this topic. Using a tool like SEMRush’s topic research tool, you can take your primary keyword (topic), and get expanded/related topics, a SERP snapshot and questions in a single view. I like this because it covers what many other tools do separately. Ultimately it supports both content expansion & SERP analysis at the same time. Use keyword suggestion tools like KeywordTool.io or Ubersuggest to expand the terms combined with Google search results to quickly view potential topics. Use Answerthepublic.com to get expanded terms and inspirational visuals. Alternatively, Ann Smarty offers up four additional tools, for related keywords to support topical expansion. You’ve taken note of what to write about, and how to cover the topic fully. But how do we begin to determine what type of content and how in-depth it should be? Format – Is the information formatted as a guide? A how-to? Maybe a list? Differentiation points – What stands out about the top three results compared to the rest? Topic and objective – Your topic is your primary keyword phrase. Your objective is what this content supposed to accomplish. Audience and objective – Based on your keyword intent mapping, describe who the article is meant to reach. Topical coverage – Top three related keyword phrases from your topical expansion. Questions to answer – Top three to five from topical expansion findings. Ensure they support your related keyword phrases as well. Voice, style, tone – Use an existing content/brand style guide. Content type and format – Based on your SERP analysis. Content length – Based on SERP Analysis. Ensure you’re meeting the average across the top three results based on content type. Deadline – This is only pertinent if you are working solo, otherwise, consult/lean on your creative team lead. Want to take a shortcut? 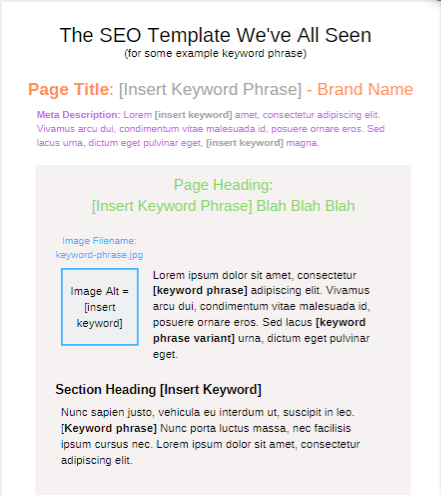 Feel free to download and copy my SEO content brief template, it’s a Google doc. If you want to streamline the process as a whole, MarketMuse provides a platform that manages the keyword research, topic expansion, provides the questions, and manages the entire workflow. It even allows you to request a brief, all in one place. I only suggest this for larger organizations looking to scale as there is an investment involved. You’d likely also have to do some work to integrate into your existing processes. Jori Ford is Sr. Director of Content & SEO at G2Crowd. She can also be found on Twitter @chicagoseopro. The post SEO writing guide: From keyword to content brief appeared first on Search Engine Watch. Dieser Beitrag wurde unter SEO abgelegt am 23. April 2019 von Andreas.